iVascular recruitment of patients for Angiolite clinical trial. iVascular S.L.U. is pleased to announce that the recruitment of patients for the ANCHOR clinical trial has been completed with 104 patients treated with the sirolimus eluting stent ANGIOLITE and first interim 3-month data has been presented at EuroPCR Congress 2016. Coordinated by PI Dr. Josep Rodés-Cabau from Quebec Heart and Lung Institute, the objective of ANCHOR clinical trial is to perform a prospective assessment of feasibility, exploratory efficacy and clinical performance of the novel ANGIOLITE sirolimus-eluting stent utilizing intracoronary optical coherence tomography (OCT). 104 patients with de-novo lesion, including those with chronic stable angina, acute coronary syndrome (NSTEMI) or in the setting of elective PCI have been included. An adaptive design of the study has randomized patients to either 3-month or 6-month angiographic/OCT follow-up. Clinical follow-up will occur at 30 days, 3 months, 6 months, 12 months and 24 months post PCI. The interim analysis at 3-month follow-up shows the following OCT-measured results: out of a total of 5892 struts analyzed, 89.1% ± 19.0% of covered struts, with neointimal area obstruction of only 6.1% ± 8.6%. The incomplete strut apposition rate (ISA) is 0.97%. This OCT results are supported by angiographic values of LLL = 0.07 ± 0.23 mm and 0% binary restenosis. 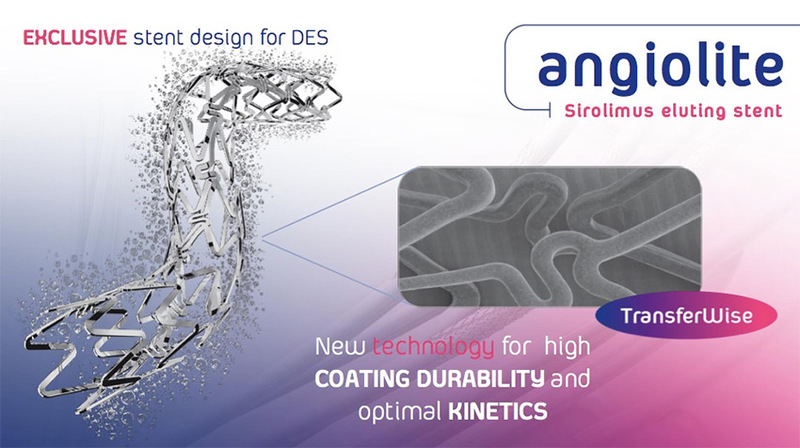 Mr. Lluís Duocastella, CEO of iVascular, commented, “We have successfully implemented a new coating technology based on the deposition of nanodrops of sirolimus and a new fluoroacrylate polymer on the surface of a stent. We are able to generate a homogeneous multilayer coating that is showing promising outcomes in clinical phase. Efficacy and safety are optimized by enhancing coating mechanical endurance and an optimized drug release profile”. ANGIOLITE is commercially available in all Europe and other markets where CE Mark approval can expedite the registration process.